Greenshot is a free lightweight screenshot taking utility with loads of features. Greenshot when run sits in Windows system tray and you can invoke the app with shortcuts to take screenshots. When you right click on the Greenshot icon in the system tray you see the various available options. 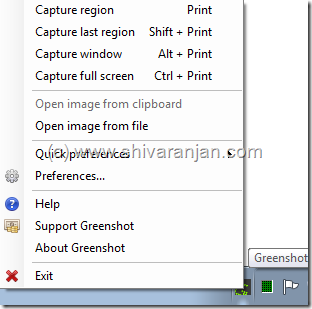 Greenshot can capture screenshots in free region mode, capture a window, capture full screen and capture the last selected region. All these screenshot taking modes can be invoked using the keyboard shortcuts. Draw a rectangle – the line thickness, colour can be adjusted. Draw an eclipse – the line thickness, colour can be adjusted. Draw an line – the thickness and colour of the line can be adjusted. Draw a arrow- the thickness, colour of the line can be adjusted and the arrow heads direction can also be altered. Add Textbox- you can add text box and enter desired text. Highlight a particular area in the screenshot. Blur some area of the screenshot selectively. The only thing that I felt was missing was the ability to undo a effect using a single click. The developer should consider the option of ‘undo’ in future updates. 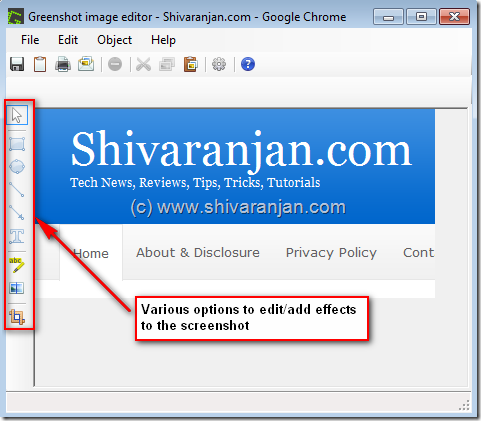 The screenshot can be saved as a file, sent as an email attachment, can be printed and copied to clipboard using the options available within the image editor for Greenshot application. The Greenshot app just weighs close to 6ooKB but there is no option to run the app without the installer. The developer should consider releasing this app portable version so that it can be run straight from a USB drive. This app was tested under Windows 7 and it ran without any issues. hete every stuff is quality based data. data, is there any other site which presents such stuff in quality? It’s remarkable to go to see this website and reading the views of all mates regarding this piece of writing, while I am also keen of getting familiarity.